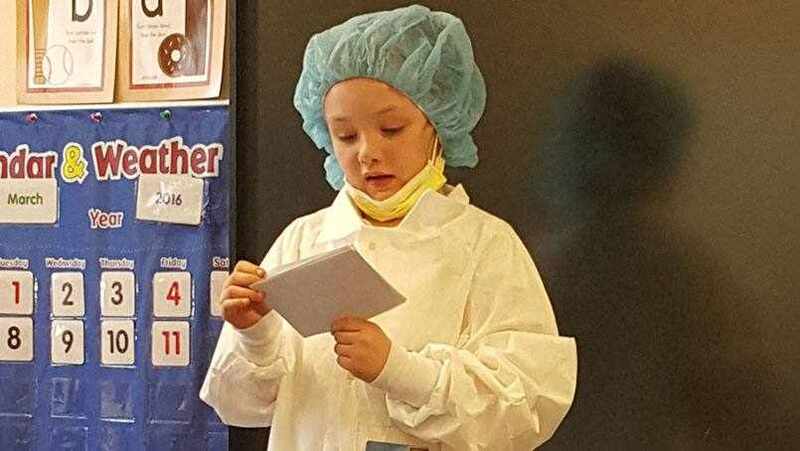 Olivia Worlton's teacher at Rochester Arts & Sciences Academy gave her class an assignment: Pick a hero, learn about him or her, and then present what you've learned to the class. While most of Olivia's fellow first-graders picked historical figures or their parents (aww), Olivia had someone else in mind. She chose William Shaughnessy, M.D., an orthopedic surgeon at Mayo Clinic's Rochester campus. That decision didn't surprise her parents. "He changed her life," says Olivia's mom, Heather Worlton. But it did surprise Dr. Shaughnessy. "First graders have lots of heroes to choose from," Dr. Shaughnessy notes, including teachers, police officers, fire fighters and military personnel. "I was honored and humbled that she would think an orthopedic surgeon was in that same mix," he tells us. But to Olivia, the choice was obvious. "He is very smart and helped me so I was not in pain, so he is my hero!" she wrote in her report. Read the rest of Olivia's story.